For any of our challenges, you can always use an Anything Goes theme. We want everyone to be able to play along and have fun. I chose Christmas for my card. This is the sweet image I chose. June 20th at midnight EST. Get on over to the House Mouse and Friends Monday Challenge blog and take a look at the midweek inspiration the design team has come up with. Then get busy and join us, we love to visit you to see what you come up with. 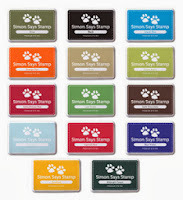 Also very proudly Sponsored by Heidi and Simon Says Stamp!! stunning! beautiful card have you made! have a nice day, Sue. Oh wow Sue..stunning christmas card sweetie !! WOW- What beautiful detailing and super fantastic coloring. Sooo adorable! LOVING the textures especially. FAB take on the HOLIDAYS theme. Such a BEAUTIFUL card Sue!! Your colouring sure brought these two sweet friends to life!!! Love all the wonderful accents!! Have a great day Sue! A gorgeous card Sue, such a fabulous image (great minds think alike), we both used the same image but made very different cards - yours is beautiful. Such a cute image and fab card. Awww such a sweet image! Stunning colouring and beautiful design. Wow! What a gorgeous Christmas card. Such beautiful coloring and I love the lace and trims you used too. This is truly GORGEOUS Sue!! I love that wooden background with the wreath over it!! The touch of lace looks stunning with it too!! :) LOVE IT! You sure have been going all out on all your cards girl...so many layers and wonderful coloring! Great job!